The New York Racing Association beat the drum for the Woodward that summer−first, by giving away a free ball cap honoring Rachel Alexandra to fans early on in the meet and then distributing posters, decorative pins and banners that were hung around town at the end. When the field hit the top of the stretch with the filly in front, a cheer that was heard miles away went up as if everyone had wagered on her, which, of course, was not true. The cheer kept on building−all the way to the victorious end. The summer of 2012 at Saratoga wasn’t the “Year of the Girl,” but the “Year of the Disappeared.” There is a woman in charge of the track, yet it often seems like nobody is home. Before the meet began, the former CEO and his sidekick were thrown under a bus for hiding the fact that NYRA was taking a bigger slice of the pie than it should have from exotic wager winners. Anyone who believes they were the only people who knew of the (mis)take is a fool. On the last weekend of racing, the NYRA employees, who aren’t among the association’s ten VPs, ask openly if you believe that they’ll be around for long. Gov. “No-Show” Cuomo is lying low (the choice of word is purposeful), knowing that a government intervention is feared. New York State made a mess of OTB. Yet, only the most naïve would expect the status quo. The current franchise lost $24 million in 2011. “I’ve got all, all. I won the Pick Six,” exclaimed Jim McGaughan of Glenmont, N.Y., as To Honor and Serve crossed the finish line ahead of Mucho Macho Man in this summer’s Woodward. Even though there were two races left, all that McGaughan had to do was wait to learn how much he won. The Pick Six paid $155,787. A longshot specialist, apprentice jockey Wilmer Garcia, saved his bacon with A New York Phillie, the 36-1 winner in the last race. Neatie the Cat, the 3-2 favorite, nipped 14-1 Western Tryst in the 11th race. Had Western Tryst won the race, who knows how much McGaughan would have won. The Wishing Well was the place for winners in the evening. Charlotte Weber of Live Oak Plantation, the owner of To Honor and Serve, Kiaran McLaughlin, the trainer of Saturday’s Forego Stakes (gr. 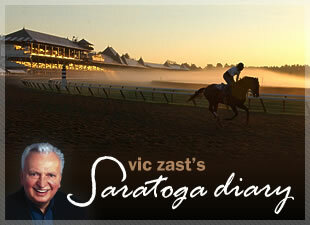 I) winner Emcee, and the meet’s leading trainer Todd Pletcher dined there. Roses decorated the piano in the barroom to commemorate Bob Lee’s passing 10 years ago. Lee ran the restaurant with his wife Brenda, who still operates the Wishing Well with her son Bob, Jr.
Bands were playing on Broadway. Despite the missing, it was not the Titanic.